Can a Machine Learn the Fourier Transform? kHz, or $100 + k 100$ kHz. 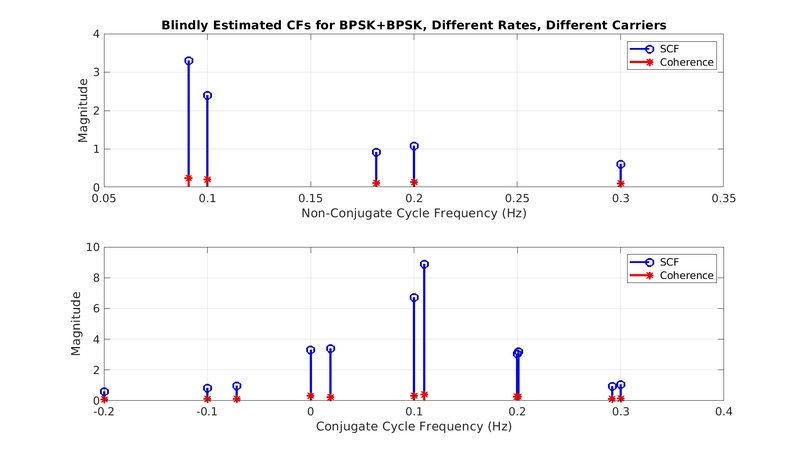 Some signals may have only non-zero non-conjugate CAF values (such as large-alphabet digital QAM), some only non-zero conjugate CAF values (such as analog amplitude modulation, discounting the ever-present non-conjugate cycle frequency of zero), and some have both (such as our favorite signal, the rectangular-pulse BPSK signal). axes are different between the plots for the two signals). This is a direct consequence of the fact that the rectangular-pulse signal is strictly time-limited whereas the SRRC-pulse signal is strictly bandlimited. hello, could you please explain why cyclic frequencies in your example are equal to k* (0.1) MHz? I’ve updated the post to answer your question. Leave a comment if unclear! Hi Ben. The CSP Blog is a self-help blog. I don’t give out much code. Let me know if you get stuck, though, trying to write your own. That’s the only way you’ll really understand CSP. Undefined function or variable ‘t’. So you need to fix that first. I see that you are trying to compute a statistic for a large number of cycle frequencies and delays. I would like to suggest the following: Divide and conquer. Do the simplest things first, then build up to the most complicated. For example, try to estimate the cyclic autocorrelation for just a single cycle frequency (say, zero), and a few delays (tau) near zero. Then try to extend to all delays. Then extend so that you can specify any cycle frequency. Finally, when that is all correct, put it in a loop and call it for as many cycle frequencies as you want. i would like to know about the theorical formula for bpsk cyclic autocorrelation ? is there any listed reference? I’ve updated the post with references that should help you find the answer to your question. Let me know if you still have problems or questions. Subscript indices must either be real positive integers or logicals. Is it running without errors on your system? I think you should at least make sure the code runs before sending it to someone else. So you are mixing fractions with integers in your indexing. This isn’t the kind of debugging I normally help with as it doesn’t have anything to do with understanding CSP. I use rectangle pulse for BPSK. But the CAF shows followings: 1)there are only 3 lines (represent alpha=-2fc, 0, 2fc)when delay tau=0, and it do nothing with symbol rate; 2)CAF quickly decreases and tends to constant as delay increases when alpha is 2fc. Are those right? Why can’t find cycle frequencies related with symbol rate? Thanks in advance. Did you use your own rectangular-pulse BPSK signal? What happens if you use the one I provided at the end of the post on rectangular-pulse BPSK? See the end of that post for details. 1) What is the CA formula of BPSK signal? I only find the cyclic spctrum formula in the book Statistical Spectral Analysis; 2) Should s[t] multiply by e^-j*pi*alpha*t before calculating delay product, like code written by Ben Mohamed aboved? is my doctoral dissertation, which can be downloaded from the CSP Blog here). Or, look at formula (4) in the post on digital QAM and PSK. Specialize that formula to the case of . That formula is slightly more general than the formula for the “symmetrical” cyclic autocorrelation. The symmetrical autocorrelation uses the lags and , whereas the formula (4) uses generic lags . You don’t have to multiply by before averaging the lag product. You can either multiply the lag product by or multiply by and by and then multiply them together. I suggest that you first try to get the cyclic autocorrelation correct for a single cycle frequency before you try to write code that computes the entire cyclic autocorrelation surface. I have seen many attempts at the latter that fail due to not understanding how to do the former. 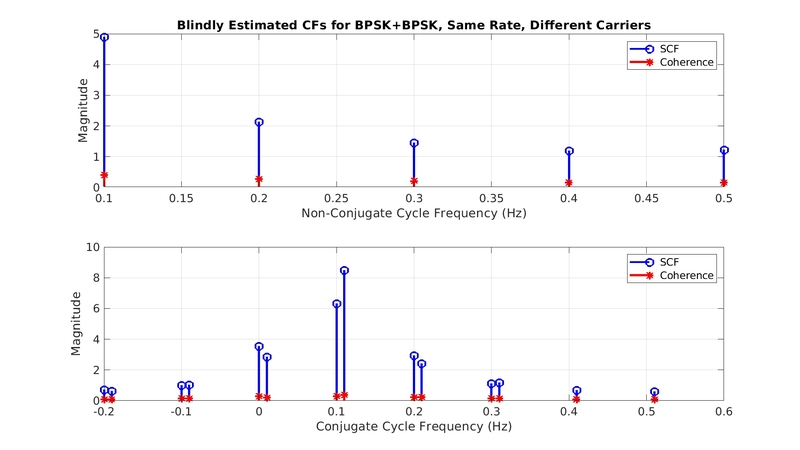 By the way, the surface I show in the post includes cyclic autocorrelation estimates for only those cycle frequencies that are known to exist for the rectangular-pulse BPSK signal I used. “The non-conjugate CAF can be interpreted as the correlation between the lag product and the complex-valued sine wave ”. Suppose I have a signal x1…x10. I want to calculate the CAF for tau=2 and alf=0.1. Then the calculations should be like this? Almost correct; you definitely have the right idea. In Step 3, you’ll want to divide the sum by the number of elements that you have included. In this case . I think you chose a signal having only ten samples to make the comment formatting easy, but just to be sure I need to say that you’ll need to average over longer durations for any signal of practical interest. How averaging should be carried out? or, at the first stage, calculate the lag product for x1-x10, x11-x20, …, x991-x1000 and then average, getting the one vector of the lag product of 8 elements long? The former is correct. Make sure your signal vector is long enough (pop-quiz: how?) and then use the method you wrote in your earlier comment with my slight modifications. 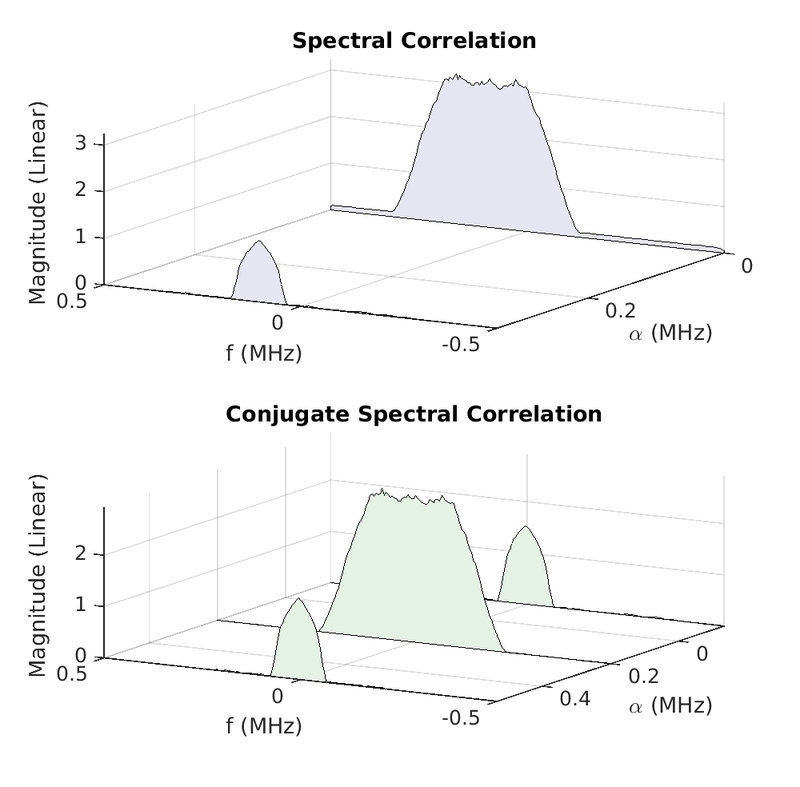 Each value of the lag product must be multiplied by a corresponding element of the complex sine wave to achieve the correlation between the lag product and the sine wave. If you take your long X vector and create a lag product and then average that, you’ll be destroying any sine-wave components (except for ) that might exist in the lag product. “You don’t have to multiply by exp() BEFORE AVERAGING the lag product”. And in your blog https://cyclostationary.blog/2015/09/28/the-cyclic-autocorrelation/ is equations 4 and 7. In equation 7, multiply by exponent is actually performed after averaging (E[…]). Then how is it that the former is correct (just take X long)? pop-quiz: how? – Determined by the required resolution Frequency and Cycle Frequency. I mean, where did I write that? Yes, if you could average over the ensemble using , then you could extract the cyclic autocorrelation from the resulting time-varying function through the Fourier-series operation. But your original question was about data , not an ensemble. Don’t forget Equation (8) in that post! That’s what you use on data. And the context was some code written by readers in which the input signal was multiplied by prior to forming the lag product. So what I said was a rather trivial observation that you can multiply the signal by an exponential related to (and also multiply the conjugate by the appropriate exponential! ), then form a lag product, then average. Or you can form the lag product, then multiply it by . I realized simple model of the implementation of CAF and SCF. The result is generally similar to that in your blog. 1.For a single input (y_of_t = x_of_t1 + 0.0*x_of_t2+ n_of_t;), non-conjugate CAF and conjugate CAF match your results. But if there are two input signals (y_of_t = x_of_t1 + 0.99*x_of_t2+ n_of_t;), then two signals are visible on the conjugate CAF, and only one on the conjugate CAF, that is, one signal is lost. Why? 2. Your non-conjugate SCF has a look that is different from my result (lagdot=x1.*conj(x2);). And on the graph of the conjugate SCF (lagdot=x1. *(x2);), the cyclic frequency axis is digitized in the other direction (if without fliplr, fliplr(axis_alf)). %% Create the baseband signal. % Create symbol sequence from bit sequence. % Convolve bit sequence with pulse function. %% Frequency-shift the baseband signal and add noise. % Apply the carrier frequency. y_of_t = x_of_t1 + 0.99*x_of_t2+ n_of_t;%!!!!!!!!!!!!!!!!!!!!!!!!!!!!!!!!!!!!!!!!!!!!!!! Regarding Question 2, I’m not sure what you mean by the reverse digitization of the cycle-frequency axis, but in most of my surface plots I tend to view the surface so that cycle frequency increases toward the viewer and spectral frequency increases to the left of the viewer. This is just for convenience and is a consequence of the fact that in the non-conjugate surface, the PSD is the largest slice and tends to block the view of the slices. Later you take the Fourier transform of the obtained cyclic autocorrelation estimates, but remember that you are taking the Fourier transform of the magnitude (abs) of the estimates here. The phase information in the cyclic autocorrelation estimates is what leads to the frequency shift that you’re missing.